Scotty Morgan was born in 1934 in Candler, North Carolina. He enlisted in the Aviation Cadet Program of the U.S. Air Force on March 26, 1954, and was commissioned a 2nd Lt and awarded his pilot wings at Bryan AFB, Texas, on August 16, 1955. After completing F-84 Thunderstreak training and reconnaissance training, he was assigned as an RF-84 Thunderflash pilot with the 29th Tactical Reconnaissance Squadron at Shaw AFB, South Carolina, from June to September 1956, followed by service with the 6021st and 6091st Reconnaissance Squadrons at Yokota and Johnson AB, Japan, from September 1956 to December 1957. Lt Morgan next served as an RF-101 Voodoo pilot with the 15th Tactical Reconnaissance Squadron at Kadena AB, Okinawa, from January 1958 to August 1959. After completing Weapons Controller School at Tyndall AFB, Florida, Capt Morgan served as a Weapons Controller with the Portland Air Defense Sector at Adair AFS, Oregon, from November 1959 to June 1962, and then with the 6146th Air Force Advisory Group and 314th Air Division in South Korea from June 1962 to July 1963. His next assignment was as an RF-101 pilot with the 45th Tactical Reconnaissance Squadron at Misawa AB, Japan, from July 1963 to until he was forced to eject over North Vietnam while on temporary duty to Southeast Asia on April 3, 1965. He had been rotating to Southeast Asia since October 1963, and had flown 94 combat missions before being shot down. Capt Morgan evaded for two days before being captured and taken as a Prisoner of War on April 5, 1965. After spending 2,871 days in captivity, he was released during Operation Homecoming on February 12, 1973. 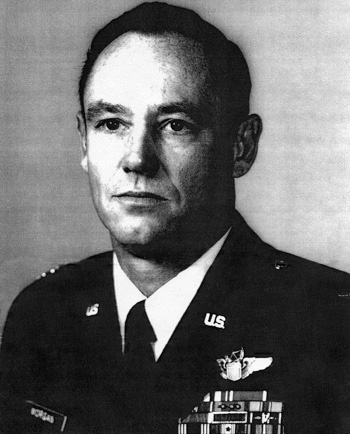 Col Morgan was briefly hospitalized to recover from his injuries at Maxwell AFB, Alabama, and then attended Air War College from August 1973 to May 1974. His next assignment was with the 67th Tactical Reconnaissance Wing at Bergstrom AFB, Texas, from May 1974 to January 1977, followed by service on the staff of Headquarters 9th Air Force at Shaw AFB, South Carolina, from January 1977 to September 1980. His final assignment was at Pope AFB, North Carolina, where he retired from the Air Force on October 1, 1985. 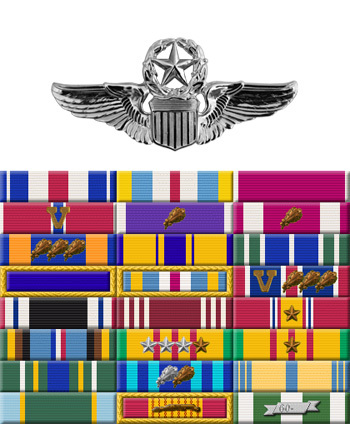 For the period August 1966: This officer distinguished himself by gallantry and intrepidity in action in connection with military operations against an opposing armed force during the above period while a Prisoner of War in North Vietnam. Ignoring international agreements on treatment of prisoners of war, the enemy resorted to mental and physical cruelties to obtain information, confessions, and propaganda materials. This individual resisted their demands by calling upon his deepest inner strengths in a manner which reflected his devotion to duty and great credit upon himself and the United States Air Force.